Lately, due to both of our travel schedules, I haven't been able to cook during the week. So on Sunday I love to cook something that takes a lot of time. The supermarket had beef short ribs on sale, and since I had never cooked them, I decided to try them. I browsed recipes on epicurious.com and finally decided on this one. The original recipe, with my changes noted, is below. 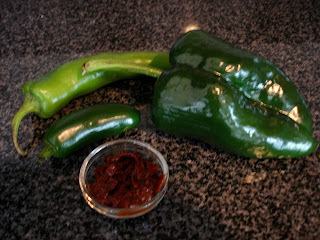 The recipe called for three Anaheim (California) peppers and chipotle peppers, but I decided to use a mixture of peppers pictured below - a jalapeno (the small, dark green pepper), a poblano (the larger dark green pepper), an Anaheim (the long, lighter green pepper), and chipotle peppers (chopped in the bowl). Heat oil in a large ovenproof pot/pan over medium heat. Add the ribs and brown on all sides, about 9 minutes. Transfer to a plate. Reduce heat to medium and add the onions and garlic. Cover and let simmer until tender, about 5 minutes, stirring occasionally. Add broth and bring to a boil, scraping up the brown bits. Bring to a boil, then cover and transfer the pan to the oven for about 1 1/2 hours, until ribs are just tender (this timing was right on). Remove pot from oven, tilt pot, and spoon off fat (surprisingly there wasn't much fat in the pan at all!). 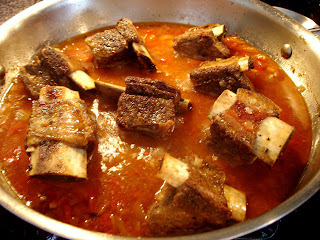 When they came out of the oven, the looked a bit more like short ribs since the meat reduced in size while cooking, allowing the bones to show. Place pot over medium heat and simmer uncovered until the sauce thickens, about 25 minutes. Season with salt and pepper. 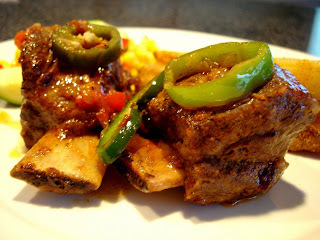 At this point you can cool the ribs and put them in the fridge for up to a day, or continue with the recipe if you are serving them immediately. Add the peppers to the pan and simmer over medium low heat until the peppers soften, about 10 minutes (they could have gone 15-20 minutes). We didn't do this step and I really don't think it would have added anything because the sauce was already so good - Garnish with freshly chopped cilantro and lime wedges. These ribs were melt in your mouth tender! The meat flaked right off the bone and was so tender and full of flavor. Being a former vegetarian I cannot believe I cooked and ate these, but I loved every bite. I would put this dish on the top of my list of favorites. I served simple sides - crispy oven fries and sauteed vegetables. Fries - I cut baking potatoes into wedges, coated with olive oil, and then rubbed with a mixture of cornmeal, chili powder, cumin, cayenne, salt, onion powder, and garlic powder. I baked them on 400 for 20 minutes - 10 on each side - and then turned the broiler on at the end. Crispy and delicious! Veggies - I've made this dish before. It is simple, quick, and goes great with spicy foods. I sauteed 1 cup of corn, 1 chopped zucchini, and 1 chopped red pepper in olive oil with salt for about 7 minutes. If you have a few hours to cook and are looking for something savory and delicious, I'd highly recommend this dinner. Have a great week! This sounds delicious. 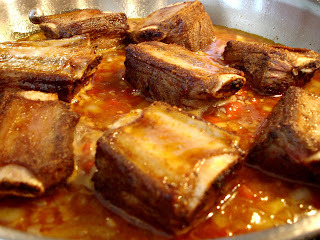 I have only made shortribs once myself, and they were braised in cabernet - very good, but very different from your preparation! I know we'd love this dish, I will have to keep it in mind! Omg I'm drooling! 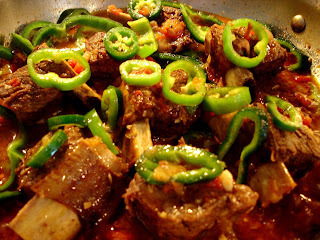 I love short ribs, this I'll have to try! I agree with you about cooking a more time intensive meal on Sunday nights. I do that a lot, because it's so nice to not have the pressure of a busy weeknight. Looks tasty! I love short ribs! I just started making them over this past winter. Nice recipe.